What does the Provisioning System do? The Uplinx Provisioning System is a commissioning system for the support of daily changes (MACD) required in operations of a deployed Cisco Unified Communications telephony system. It allows phone administrators to easily add, update or delete all objects required for a telephony end user. It supports the following objects: CUCM endusers, device profiles, phones, voicemail (on Cisco Unity Connection and Unity Enterprise), Cisco Unified Presence, Microsoft Active directory, Exchange email and voicemail and Lync. It has been designed to support all daily end user oriented MACD operations and can be performed by a less skilled operator. The Provisioning System removes the need for support staff to log onto production Cisco UC servers. It allows a less skilled operator to perform advanced commissioning tasks. It also enforces an organisations standards and policies to telephony configuration by performing real-time data validation from a single web GUI. Optionally, it can also provide administrative scopes so that a site telephony administrator can only access its own site user's and phones. What doesn't the Provisioning System do? It does not support "expert" configuration operations such as provisioning call routing information or the configuration of a new site to an existing Cisco UC deployment. The Uplinx Provisioning System only supports end user oriented operations and objects required for telephony users across all Cisco and Microsoft servers. System objects such as any route plan objects (partitions, CSS, route patterns, translations, gateways) are not supported. 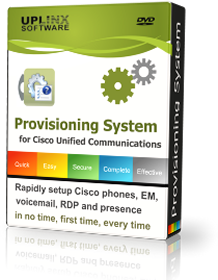 The Provisioning System covers 95% of all Cisco Unified Communication's daily end user operations of an enterprise. Cisco UC system design and implementation will always require a specialist due to the inherent complexities with setting up this information to suit each organisation's unique requirements. Can I bulk import 100 phones for a new site with the Uplinx Provisioning System? Yes. Bulk imports are supported. Alternatively, bulk imports can be run from a custom written application with few code lines by using the Uplinx Provisioning System API. How can you equate the cost savings of the Provisioning System? Save your UC experts time. Depending on the complexity to add all required configurations for a new/update/delete user in an enterprise UC deployment, realised time savings of up to 20 minutes per MACD can be achieved through the use of the Uplinx Provisioning System. Also, through the use of a single simplified screen, the Provisioning System allows for MACDs to be delegated to lower skilled staff to free your experts from MACD requests. Saving by delegating to lower skilled staff. Through the use of a single simplified screen, the Provisioning System allows standard operations to be delegated to lower skilled staff to free your experts from standard requests. The Provisioning System allows for business rules to be enforced allowing the Provisioning Screen to only present those fields that require changing. Auto validation ensures that data is validated against the Cisco CUCM prior to the provisioning job being actioned. Saving in training costs. By no longer requiring support staff to log onto Cisco UC servers, there is no longer any requirement for an organisation to have its support staff Cisco UC trained. Savings in troubleshooting time. Creating all configuration objects (such as CUCM user, phone, device profile, voice mail, RDP) on several Cisco servers has become a complex process which requires a lot of training and understanding of Cisco specific technology. This process is challenging for experts and has become impossible for less skilled users, especially in large enterprises. The more servers that need to be accessed increases the chance of a phone administrator to make a mistake. These types of mistakes are costly as it may require all servers touched during the provisioning job to be revisited. As the Provisioning System is an automated and rule based process which validates entered data and operations, mistakes are eliminated and even complex actions are performed correctly, first time, every time. Saving in integration costs. The system can be easily integrated into an existing Enterprise Configuration Management (ECM) to include provisioning of end users into their Cisco Telephony system via the Provisioning System API. Savings in standardization of configurations. Economy of scale benefits can only be achieved with a standardized process and standardized setup procedures. The Uplinx Provisioning System ensures that all users and devices are configured to an organisation's standards. This is enforced through the core configuration/job templates which are created based on sites. These templates only need to be configured once and are used to enforce standards. This then leads to savings in maintenance, troubleshooting and user support. Automation by Syncing to Active Directory. Automatic user change detection in Microsoft Active Directory allows a complete sync of all user related objects (users, phones, Cisco Extension Mobility profiles and voicemail) to Active Directory by a rule and template based system. Our Auto Provisioning for Cisco makes it easy to perform fault free provisioning. What kind of integration does the Provisioning System offer? Email integration: Sends out email notifications to site administrators and end users on the receipt and completion of MACD jobs. Intranet based portal which allows endusers to submit MACD requests. This can be integrated into an organisation's Intranet. Uplinx provide this code with the Provisioning System. APIs to submit requests to the Provisioning System by other systems (see API section). This is to integrate enterprise systems such as Enterprise Commissioning systems, Human Resource Management systems and service desks with the Provisioning System. With this integration, it is possible for an MACD related change in a HR system to trigger a telephony MACD job in the Provisioning System. As there are a vast array of HR and service desk applications in the market place, the Provisioning System offers a set of APIs based on industry standards which can be interfaced with an organisation's existing systems. Script Integration. Any script can be called during job execution to execute custom tasks such as adding data to a ticketing system. What API interfaces are provided? New requests API: Push information and requests to the submit screen and start the workflow by your case or ticketing system. The Web services on the Provisioning System support XML SOAP over HTTP and can be accessed over the network via any standard programming language which supports Web Services clients. All popular programming languages and platforms support Web service clients such as Java, .NET, PHP. Can Uplinx provide integration services for its API? Uplinx Software offers integration services to work in cooperation with the application owners within an organisation of the system they want to directly interface to the Provisioning System via its published APIs. If there are no experts within an organisation with the necessary application knowledge and programming skill for the system in question, we would be happy to engage the necessary experts to provide a full turn-key solution. How is Active Directory supported? Microsoft Active Directory is used to source data for commissioning requests to the Provisioning System to help in populating provisioning field information. The re-use of data from Active Directory ensures that the user's configuration objects are correctly provisioned in the Cisco UC servers. Active Directory is also used for site administrator login authentication and to optionally limit access to an end user's phone. What is the change tracker for Active Directory? The change tracker can be optionally enabled per site to track changes within Active Directory. Changes found to AD users, such as added, updated or deleted AD users can start the workflow in the provisioning process. It sends out a list of changes found which allow a telephony administrator to efficiently act on these user changes. Changes are displayed at the bottom of the Provisioning System console and can be easily pushed into the screen to create/update/delete telephony objects. Does the system support auto commissioning? Yes. We encourage you to evaluate the Report Tool before you purchase it. The trial version has all the features of a fully licensed Yes. Uplinx Auto Provisioning for Cisco minimizes provisioning effort and provides fault free provisioning based on rules and templates. Provisioning can be run fully automated based on rules, or if supervision is desired, a site administrator may approve and update commissioning jobs created by the system. Alternatively, the Uplinx Console allows performing complex and non-standard operations at hoc for a site administrator or help desk operator. Only a trained phone administrator or service desk operator may understand the telephony requirements of a new phone user and will select the correct telephony class for a user when no rule or information in Active Directory is present. Human intervention is required when varying models of IP handsets may be required for different users. Auto provisioning may not fit into any enterprise due to the disparate and complex nature of todays business processes and systems. Merging current business processes into one may not be an option or requires to many organizational changes. For example, Auto Provisioning integration into a HR system requires that the HR system contains decision elements such as telphony classes (is the user a standard user, call center user, assistant or manager?). The person entering the HR record would need to make the decision on behalf of a telephony administrator. The Uplinx Provisioning System for Cisco and Microsoft Exchange and Lync is an "off the shelf" solution which can be configured through its job templates to cater for the majority of organisations telephony support requirements. It offers various integration options such as the Console for operator based provisioning or rule based automated provisioning with optional approval by a site admin. Does the system include a Self Service Desk for end users? Yes. A simple Self Service portal is included and allows an end user to reset its PIN and passwords on Cisco CUCM and Unity Connection. It can be customized and can be deployed on an Intranet server to perform actions through the Uplinx API. More complex operations require the attention of a telephony administrator to ensure the correct information is included in a provisioning activity. The Provisioning System however comes with a Web Portal which allows end users to submit requests to a site telephony administrator. The telephony administrator can then efficiently fulfil the request and email out a notification of the completed request. Can the system restrict access on a centralised, multi-tenanted CUCM? Yes. Administrative Scopes are available so that site administrators of multiple tenants have only access to users and its configuration objects within scope. In conjugation with Active Directory rules, access can be restricted even if multiple tenants are on the same Cisco Callmanager or Cisco Unity Connection server. Administrative Scopes consists of a set of rules which can limit access of specific telephony administrators to specific end user telephony objects per site. For example, access can be restricted on the membership of an end user in an Active Directory Organizational Unit or a phone device pool, or a site extension range. Administrative scopes are then assigned to telephony administrators to limit visibility and operations. Can we have a trial version for testing purposes? We only issue trials to customers for use in their own dedicated Proof Of Concept (POC) environment. We require an NDA to be signed and a test plan outlining the requirements and criteria that need to be met for an organisation to move forward with purchasing the system. We offer a remote customer lab which allows you to login and experience for yourself how easy and quick it is to use the Uplinx Provisioning System. This lab is regularly updated with the latest releases of our software applications so the latest features can be tested. Please contact us to organise access to our remote lab or to acquire trial software. What reporting does the Provisioning System support? The Provision System includes a set of standard reports which include executed jobs and details of performed steps on the telephony servers, job statistics per phone administrator or per site, and user audit logs. Job statistics include the number of MACDs provisioned for a complete environment, region, site, or individual phone administrator. These reports can be used for usage based billing (how many jobs executed per site in a time period). 8x5xNBD support is provided for the provisioning system software. As this is a non critical component, no call processing functionality is impacted. Manual provisioning on CUCM can be used as a workaround. Do we have to purchase a new version once we upgrade our servers? No, all versions are included in the annual software maintenance which must be ongoing to receive updates.